A large number of us have a fireplace or wood-burning stove at home nowadays. More and more of us are choosing it for heating either as a primary source of heat in a room, or as a secondary one in our lounges and living rooms. But with them come certain safety precautions that we need to consider. This month we are focusing on carbon monoxide. With the summer period an ideal time to service our fireplaces and stoves (not to mention our boilers and any other fuel-burning appliances we have at home) it is also the right time to make sure we are safe from carbon monoxide. Carbon monoxide is formed when a fuel burns without enough oxygen so it does not burn properly. Many of us associate it with gas, but the reality is that it can happen with the combustion of any fuel in a poorly ventilated environment. It is formed when insufficient oxygen means that carbon monoxide is produced during combustion instead of carbon dioxide. When inhaled it binds with the oxygen in our body and prevents it from getting around our body and reaching our blood cells in order to nourish us. Carbon monoxide leaks can occur when chimneys and flues are blocked, or if there is a gas leak in a poorly ventilated area – the home or garage for example. Turn off all appliances that do not use electricity. Call the gas emergency number on 0800 111 999. Remain outside until you are told that it’s safe to go back in. Get yourself checked by a doctor. If you have been affected you may not realise and the clearer air outdoors will not be sufficient treatment. Any others, including pets, who may fall ill even if you don’t. They may be more susceptible to smaller changes in air quality. Symptoms improving when you leave the house and coming back on your return. Similarly, if they only occur in the winter when you are more likely to have closed windows and working appliances, this could indicate a low-level leak. Black or sooty stains on gas fire covers or yellow stains on and around stoves or fires. A build-up of smoke, which could indicate a faulty flue. 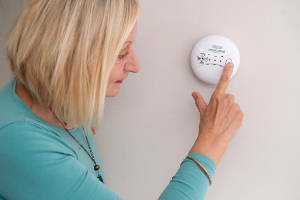 Installing a carbon monoxide alarm is an excellent way of getting early warning of any problems before they become worse. and we’ll sort it out for you.